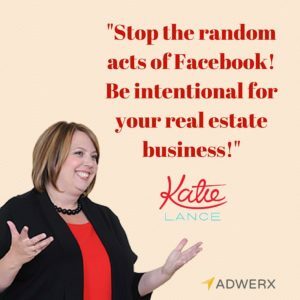 Recently, Adwerx CEO Jed Carlson was the lucky guest of social superstar Katie Lance for her webinar on Facebook advertising for real estate. In case you missed it, here is the replay. There was so much good information for agents who want to be savvy with their social efforts. For instance, the average adult has 300 friends — that’s double from just a few years ago! Katie’s overall message for social media is “be intentional.” But that doesn’t mean you have to be everywhere. 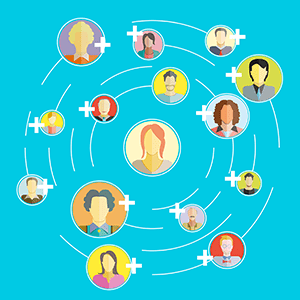 From Snapchat to Pinterest to Instagram, Facebook is still the best place to connect with your network and generate leads. Social video: if you are creating videos for your real estate business, don’t just link from YouTube. Upload the video directly to Facebook as well. That way, more people will see it and interact with it. Then run ads against the video! Facebook Live: This cool new tool lets you literally live broadcast to anyone who follows you. This works from your personal page or your business page. The video is live in real time but also stays on the page forever. If you’re in the position to get more eyeballs on your page and want one more thing to try, jump into Facebook Live! And remember, it doesn’t have to be perfect. Just authentic. Retargeting: Only 2% of people who visit your site will actually do something you want them to do — contact you, download a report, etc. So what about the other 98% of those visitors? They’re relatively warm prospects. Don’t lose them. Retargeting ads is one way to stay in front of those people. A study from 2014 showed that adults spent more than half their waking hours consuming digital content. That means they were online more than they slept! And Facebook is about 20% of the time users spend with their mobile devices. Which is why digital advertising and social media marketing is so critical for real estate agents, whether they are people in ZIP codes that matter to your real estate business or they are people in your sphere of influence. 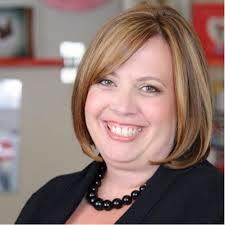 Special thanks to Katie for including Jed and Adwerx tools in her webinar! Join the launch party for Katie Lance’s new book!